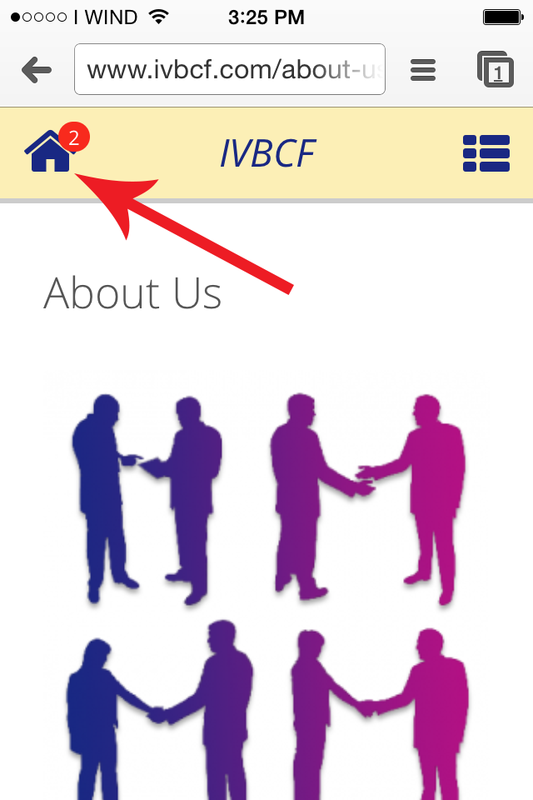 The IVBCF website responds to being accessed on a smartphone or small tablet as if it were a native app, so you will find functionality is similar to other apps you may regularly use. Here are some highlights of the basics. Don't hesitate to post questions below in the comments if there is something you'd like to see covered here! The site navigation when viewed on a smartphone is found under what is lovingly referred to as a "hamburger" icon. It is quite common nowadays so should be a breeze to figure out. In the top right hand corner of the screen (on the title bar) you will see the icon (see Figure 1)... just tap it and the Site Navigation Menu will slide in from the side (See Figure 2). 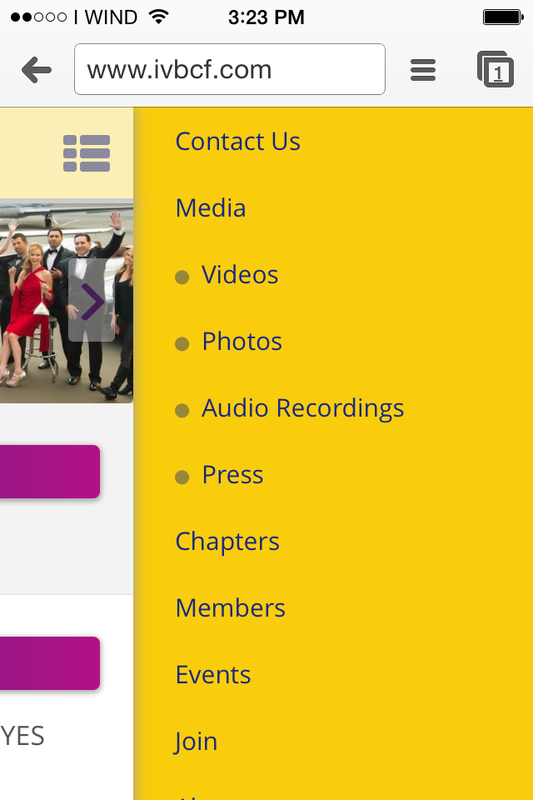 You can swipe up and down on the menu to view all the available menu links, and simply tap a link to go to the page. Figure 2. Tap a link to go to a page. Swipe up and down to view all links. 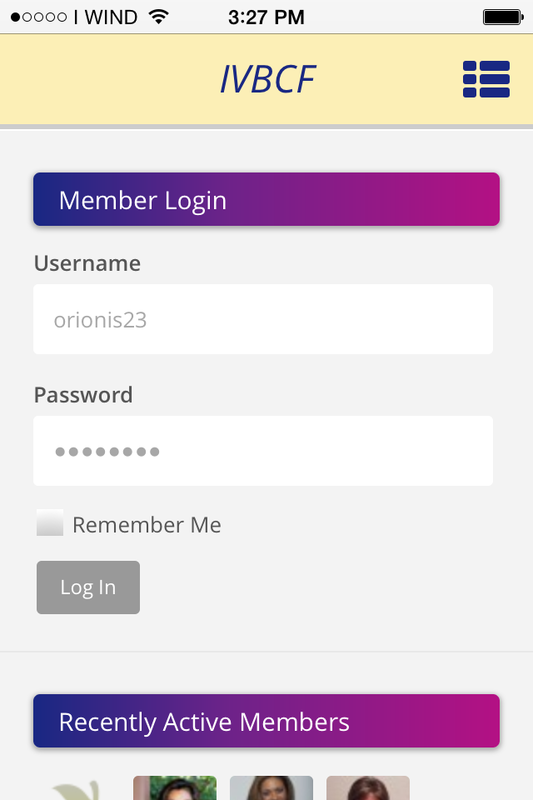 Logging in to your member account not only allows you to update your profile details, such as your personal bio, business and contact info, avatar, etc... it also allows you to make posts to the members only Bulletin Board as well as send private messages directly to other members and much more. 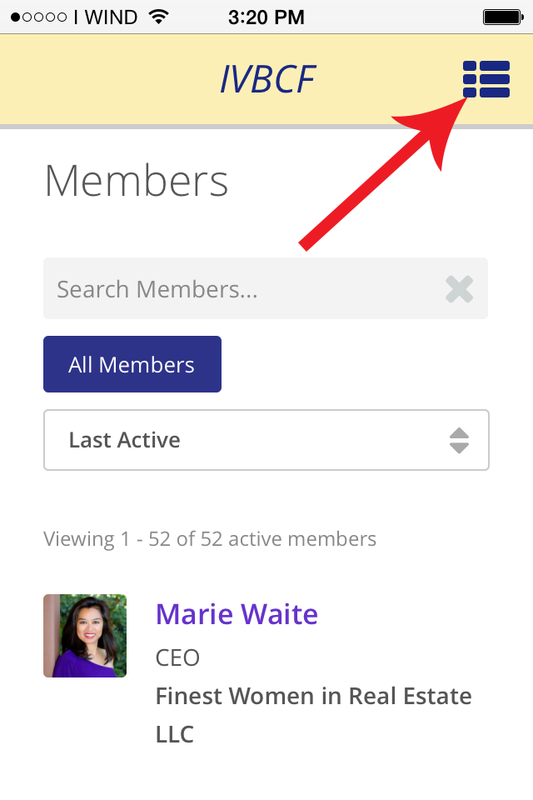 To log in from your smartphone, on any page swipe to scroll down past the primary content of any page until you see the Member Login widget (see Figure 3). 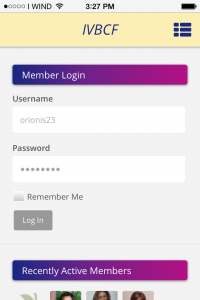 Simply enter your username and password as you would from a desktop computer and tap the Log In button. Once you are logged in, you will notice a new "home" icon on the title bar's left hand side (see Figure 4). Simply tap this icon and your User Navigation Menu will slide in from the left (see Figure 5). Swipe up and down to view all of the links on the menu, and tap a link to access that section of your profile. Figure 3. Swipe to scroll down to the Login widget. Figure 5. Tap a link to access that section of your profile account. Swipe up and down to view all links. 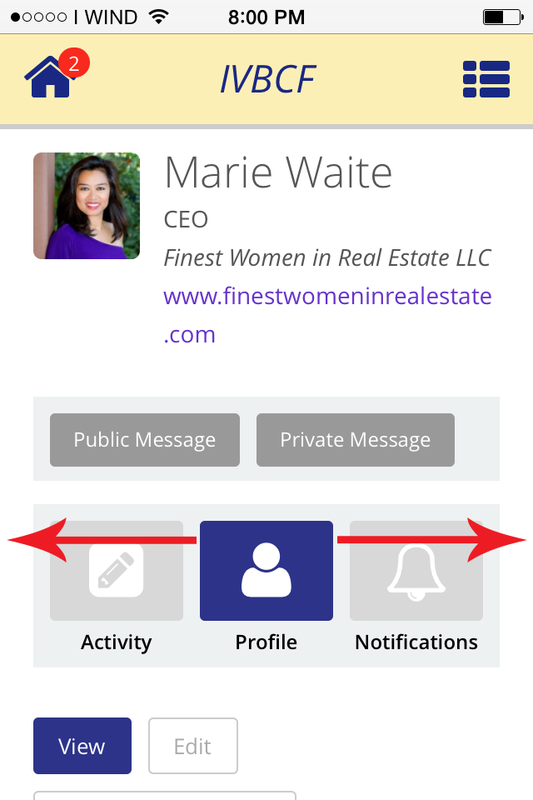 To access your own profile, start by tapping the "home" icon in the upper left hand side of the title bar to open the User Navigation Menu (see Figure 4). 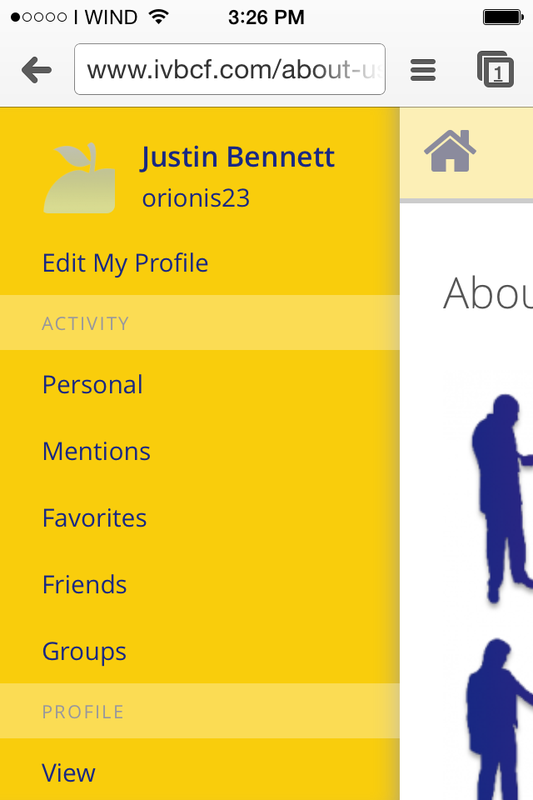 At the top of the menu will be your name and avatar (see Figure 5)... simply tap your name to go to your profile page. To visit the profile of another member (whether to read up on their bio, get their contact information, or send them a private or public message) visit the Members page of the site from the Site Navigation Menu (see Figure 1 & Figure 2). On each member's profile page (yours included) there is a Profile Access Navigation Bar for profile specific links (see Figure 6) such as Activity, Notifications, Settings, etc. Each link is accompanied by an icon. Swipe left and right on the Profile Access Navigation Bar to view all the available links/icons. Tap an icon to visit that section of the profile! Figure 6. Swipe left / right to view all the available links on the Profile Access Navigation Bar. 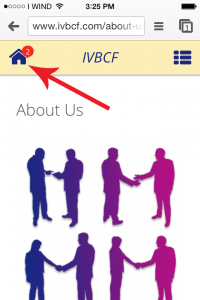 Obviously we've only scratched the surface here, and there are lots of areas to explore on the IVBCF website. Have fun, make the most of it, and if you have any questions regarding functionality of the site on smartphones or tablets, ask away here in the comments!